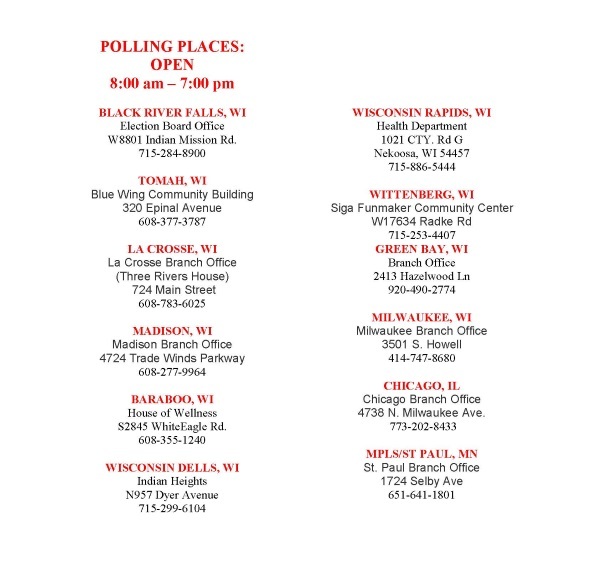 This Special Edition is to inform Ho-Chunk Nation Members of the upcoming Special Election on Redistricting. The outcome will change the boundaries of the existing Legislative Districts under the Ho-Chunk Nation Constitution. The Ho-Chunk Nation Election Board scheduled the Special Election for Friday, October 12, 2018, from 8:00 a.m. to 7:00 p.m. The Special Election will enable the Ho-Chunk Nation voters to select one of three Redistricting Scenarios. The three Redistricting Scenarios are represented by three maps showing proposed Legislative Districts containing the number of Ho-Chunk adult members and Legislators per District. Each District covers a different geographic region. The Special Election will enable the Ho-Chunk Nation voters to select the Redistricting Scenario that contains the Legislative Districts that will comprise the Legislature moving forward. • Color maps showing the existing Legislative District boundaries, as well as the three proposed Redistricting Scenarios. Each of the Redistricting Scenarios and the current map of existing Legislative boundaries are also available on the Ho-Chunk Nation website at www.ho-chunknation.com. • A brief explanation of each Redistricting Scenario. • An Implementation Plan for each proposed Redistricting Scenario. This is required by the Ho-Chunk Nation Election Code. • A copy of the Resolution adopted by the Ho-Chunk Nation Legislature, including the final redistricting proposal (which consists of the three proposed Redistricting Scenarios). • The Notice of Rules of Special Election, published and posted by the Ho-Chunk Nation Election Board. More information about Ho-Chunk Nation Redistricting can be obtained by contacting your Legislator(s) or contacting Legislative Counsel, Michael Murphy, at the office of the Legislative Branch: Ho-Chunk Nation Legislature, P.O. Box 667, Black River Falls, WI 54615; phone: 800-294-9343. Or for information about the Special Election, the Election Board office can be reached at 800-890-0583 and by email at Election.board@ho-chunk.com.